I have struggled with weight issues since I was about 10 years old, yo-yoing my way through life but always finding myself back to plus sizes. As a teenager, somehow the weight tapered down and though I always felt "bigger" than most, looking back, that was all in my head! I became a single mom at 27, gaining about 80 pounds during my pregnancy. I lost all of that weight through very dangerous drugs, nearly starving myself, and going to the gym regularly. Higher education was always in my plans, having graduated with a Bachelors of Arts at 30. After some deviation from "the plan" and making bad choice after bad choice, I eventually knuckled down and decided to work three jobs while pursuing my Masters degree. With the sheer stress of this endeavor, the weight piled on until I ballooned to a size 22. Annoyed at the example I was setting for my son, whom I always taught to eat healthy, I decided to finally do something about my weight and situation instead of complaining and wishing. Beyond the weight loss goals, my main motivators were to feel and look good, to be able to do the things I enjoyed again, and above all, to get healthier to ensure that I would continue to be around for my now 24-year-old son. My initial assessment of my health was not good: blood pressure was high, my knees and ankles hurt, and standing up was a challenge. I remember during a Bikram yoga class once I saw myself doing the tree position in the mirror and wondered how my ankles supported that much weight! As I worked hard to eat healthier and follow a good workout plan, people around me noticed my efforts—that made me feel amazing! That I would become a pillar of support and inspiration for others to change their lifestyles is humbling, to say the least. I feel lucky to have had so much support from people around me. My confidence levels have soared, and I now know that I can work toward any goal I set. This feeling of empowerment, taking control of my life, is something that I've earned. As I continue to strive closer to my fitness goal, I will also be in the process of earning IRB approval for my PhD dissertation. Want to know the most interesting thing? My mood swings and hot flashes from menopause have become much more manageable since undertaking this journey. 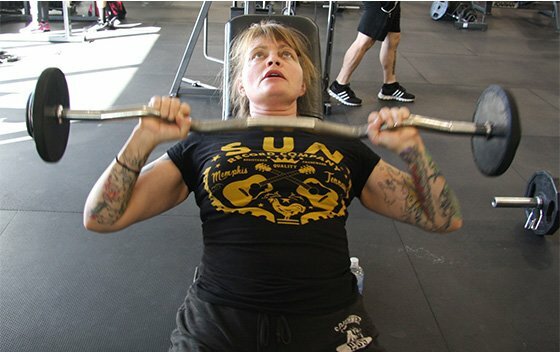 Next time I need a cure for this hormonal imbalance I just pounce on the weights and tear them up! few punk rock documentary films." I joined a weight loss program to learn how to eat, what to eat, and when to eat. I diligently stuck to the program and did not cheat for 365 days straight through. My exercise regimen included walking for at least 45 minutes every day and swimming four to five days a week at the gym. Eventually, I began pushing weights and running on the elliptical as well. I managed to drop about 80 pounds in the first year. In anyone's mind, this is progress, and it made all my hard efforts worth it. After managing to maintaining my weight three years since I started, I decided to tighten the excess skin around my stomach and hips from the rapid weight loss. Due to my age, I was told I would require surgery, but I refused. The weight continued to fall off through my own hard work and discipline—y'know, the old fashioned way! I even hired a trainer to learn how to optimize my gym time and get results. Slowly I worked my way up to strength and continued to lift weights five to six days a week with cardio mixed in about five times a week. BodySpace was a huge help, as it allowed me to track my workouts on my iPhone and keep myself on track. When I needed to shake things up, new workouts from Bodybuilding.com were the key. More importantly, the support network from the community is incredible—you give and you get. Finding the motivation is no longer a problem. The fact that I've become a role model to many of my friends easily keeps me going. I've got to set a good example. My meals are usually "a fist, a fist, and a hand" (lean protein, carbs, and vegetables). I eat 5 or 6 times a day, 3 meals and 2 or 3 protein snacks, all organic, and I prepare them ahead of time to make sure that when it's time to eat (every 2 ½ hours), I have something ready to go—this prevents cravings and stops me from putting stuff into my mouth that does not need to be there (when I'm hungry, I crave carbs and sugar, which make me hungrier, and then it's just all bad!) I drink at least 80 oz of water a day. I eat clean and train mean, as they say! I'd say the biggest challenge of the whole change was getting used to eating so much and so often. It seemed so counter intuitive to eat to lose weight! Once I got used to eating every two and a half hours and eating healthier, I changed my relationship with food. There are days that I just don't want to eat on schedule or what I'm "supposed to", but I try to remember that it keeps my metabolism going. Also, sticking with a specific training regimen is a challenge, but I aim to hit the largest groups of muscles at least four times a week and maintain a solid core. Since I constantly mix it up, I manage to avoid burning out. To continue on my journey to stay healthy and get stronger! My mid-section and rear could use a little tightening up, too. Since I lost the weight, I started surfing so I hope to get better at that! After I finish my PhD in psychology (hopefully by summer 2014), I'd like to look into becoming a trainer or some type of motivational team leader. "Nothing worth having is wrapped in anything other than sweat, hard work, and time." Give your body time to transform and keep at it! Once you start to see results, it becomes an addiction and gets easier to continue. Nothing worth having is wrapped in anything other than sweat, hard work, and time. It's not possible to drop multiple pant sizes in a few weeks; have patience. A good way to monitor progress is to take pictures every week—you'd be surprised by how your body transforms from week to week, over a period of a month or even over a year. If you're proud of your accomplishments, others will be too! Share your photos with loved ones to help inspire them. We all have body image issues. Spending too much time in front of the mirror is counterproductive; go by how you feel and how your clothes feel on you. Our heads can get the best of us and make us do some crazy things. Finally, strive for balance and be suspicious of products that seem to be a "quick fix". Bodybuilding.com has been such a major help for me. It's informative, interesting, supportive, funny, and social. For one thing, the site's nutrition tips and recipes let me try out great new recipes since I love to cook and bake. My favorite from here is the homemade pumpkin protein bars! If I need a new workout to break the boredom, I get to choose from a huge variety. And if I need supplements, the store provides all the information I need to decide whether I want to take this or that product. My experience ordering there has been positive. BodySpace keeps me accountable and lets me keep track of what's going on with me. I just love the personalization. Plus there are so many amazingly hot bodies on there! It's awesome to look at pictures of others' transformations and to be part of a supportive and motivational community. Any fitness questions of mine can be answered there.